In a large sauce pot, melt the margarine over medium heat. Add the onions and the celery; sauté until the onions are tender and translucent. Add the flour and stir to combine. Continue to cook for 3-4 minutes, stirring constantly to cook out the flour taste. Add the stock and bring the mixture to a boil and reduce to a simmer. Cook for 10-15 minutes, stirring constantly until the consistency of the sauce is just right. It should coat the back of a spoon nicely. Remove from the heat add the salt, pepper, and thyme. Combine the cooled sauce from step two with the chicken and vegetables. Gently reheat the filling in pans stirring occasionally. Cut puff pastry sheets into strips. Bake the pasty at 375F degrees for 8-10 minutes for until pastry is puffed and golden brown. 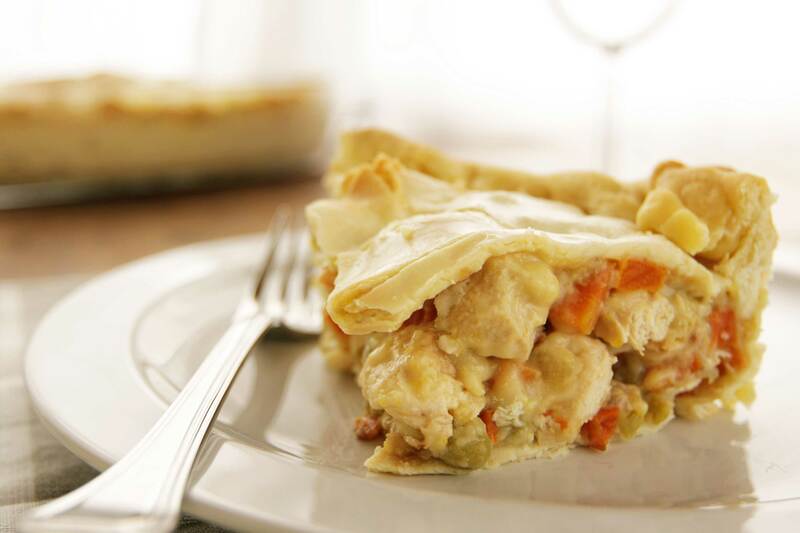 Add 6 ounces of chicken pot pie filling to an oval casserole dish and top with baked puff pastry pillow. Cover with plastic film and aluminum foil. When ready to eat, remove from freezer and turn oven to 350 degrees. Remove foil and film, then replace foil and cover. Bake for 15 minutes. Remove foil cover after 15 minutes and bake for another 10.